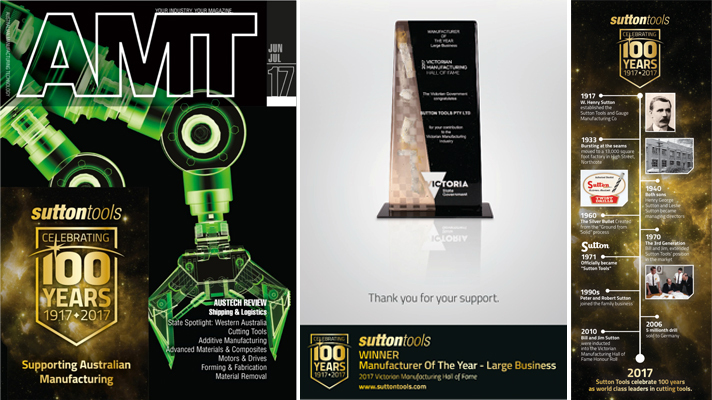 Long-time AMTIL member Sutton Tools was one of the big prize winners when Victoria’s best and brightest manufacturers were recognised at the 2017 Manufacturing Hall of Fame Awards on 9 May. In the midst of Sutton Tools planning its centenary celebrations, the latest awards from Business Victoria are the ‘icing on the cake’ for this manufacturing icon. Sutton Tools, world class leaders in cutting tools. Celebrating 100 years.